Following the first domestic trailer released back in March, Entertainment One UK has debuted a new British trailer for Mr. Holmes. This upcoming drama takes a different look at Sherlock Holmes' story then we've ever seen before, with Ian McKellen playing the aging detective, who has now retired and is living a quiet life. The drama will be released in UK theaters June 19, and in U.S. theaters July 17. In 1947, an aging Sherlock Holmes has returned from a journey to Japan, where, in search of a rare plant with powerful restorative qualities, he has witnessed the devastation of nuclear warfare. Now, in his remote seaside farmhouse, Holmes faces the end of his days tending to his bees, with only the company of his housekeeper and her young son, Roger. Grappling with the diminishing powers of his mind, Holmes comes to rely upon the boy as he revisits the circumstances of the unsolved case that forced him into retirement, and searches for answers to the mysteries of life and love - before it's too late. Milo Parker, Laura Linney, Hattie Morahan, Patrick Kennedy, Hiroyuki Sanada, Roger Allam, Philip Davis, Colin Starkey and Nicholas Rowe co-star in this drama, directed by Bill Condon. 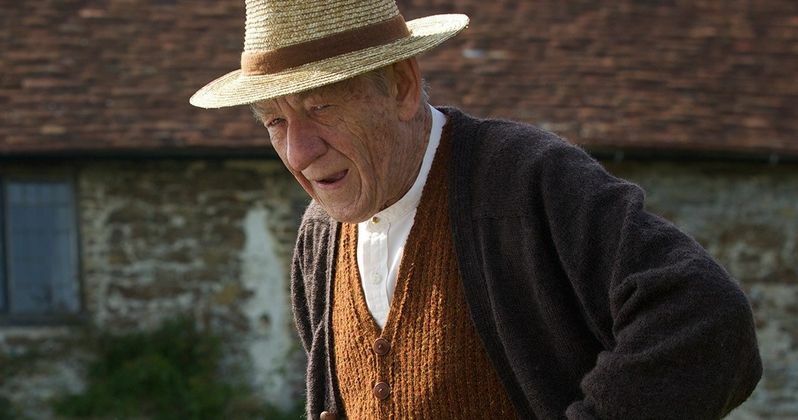 This project reunites the director and star Ian McKellen for the first time since the 1998 drama Gods and Monsters. Take a look at the new trailer for Mr. Holmes below, and stay tuned for more as we get closer to the July 17 release date.